I’m not going to hide my bias. Belgian beers are my favorites, and among them Flemish beers stand out as heroes among giants. I’m a sucker for anything funky: lambic and gueuze, Flanders reds and browns, saisons. The best beer I have ever tasted was a 1981 vintage Liefmanns Oud Bruin. So the fact that it has taken me this long to have one is insane. 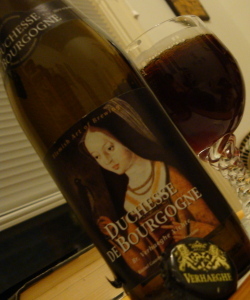 From the Brouwerij Verhaeghe in Vichte I am trying the Duchesse de Bourgogne, named after Mary, Duchess of Burgundy. All beer is variable. Other than the very biggest guys breweries cannot recreate the exact brewing and fermentation situations, and even if they could, the raw materials are never quite the same. This variability is especially prevalent in a brewery that relies on wild yeast or one that does extensive barrel fermentation or aging. As is traditional in Flanders, Verhaeghe uses both these techniques. The Duchesse is the most variable beer I have had. Sometimes it is as flavorful and smooth as the best of them, and sometimes it just comes out a vinegary mess. Let’s see how this batch is. The Duchesse pours an opal mahogany red-brown. The tan head, while somewhat wimpy, is creamy and long-lasting. The aroma is strong of acetic acid; this comes through as balsamic and cider vinegar. There is also a heavy oak vanilla character and significant fruitiness. Berries and rhubarb are complemented by mango, pineapple, and kiwi. There is a bit of a caramel note as well. The flavor is overall quite balanced between the caramel malt sweetness and a cider vinegar pucker. Oak, green apples, and raspberries coddle the sourness and temper its potential for fury. The small amount of residual sugar lends a hand, coating the lips and roof of the mouth and enticing the tongue. This one is somewhat more bitter than I remember, lending a complexity but perhaps detracting from the lingering sourness. That’s the best part of sour beer, by the way. As the various organic acids are neutralized in the mouth the flavor takes on new and interesting dimensions. A sour beer isn’t done with your senses for many minutes after the sip. The Duchesse is very much like this, with a lingering character especially on the tip and back of the tongue. The oak and the caramel linger a bit as well, but not as long. Certainly not the best bottle I’ve had of the Duchesse but a fine example of her.